Nothing says Jamaica to me like the sound of the chirping crickets at sunset! The very first time I was in Jamaica I had the honor of attending Christmas Eve mass at a little church in Ocho Rios. The humidity and heat, the songs and goodwill will always be remembered. The white flickering lights seemed to make a peeping sound in unison during the mass. It wasn't until we left the church that I could still hear the sound of what I thought was the decorative Christmas lights in the church! Every time I hear this peeping sound in Jamaica, it brings me back to my very first visit and the magic of that Christmas Eve mass in the tiny church in Ocho Rios. When I saw the title of your post I almost cracked up laughing. You are absolutely right about that sound being so distinctive. It like to drove me crazy at first because I thought it was a timer or some device malfunctioning, but then a native told me that is was some bug making that sound and I resolved that I would have to deal with it for the rest of my stay. It's so funny to me that you would make mention of them. Thanks for sharing. I miss JA so much. Looking forward to going back in June. 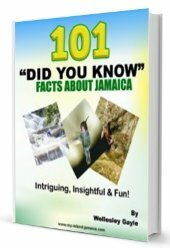 I've always been fascinated by the thought that the nighttime chirps of the crickets, in every country area in Jamaica, is the result of the male crickets, rubbing their hind legs together. Just picture it! Join in and write your own page! It's easy to do. How? Simply click here to return to JamaicanVacationSign.